Roughly eight minutes into Panamanian President Juan Carlos Varela’s opening speech at the 17th International Anti-Corruption Conference, two participants conducted a demonstration demanding the release of a Dutch journalist charged with criminal libel. Holding up a banner written, “Free Okke Ornstein,” the two stood silently in front of cameras stationed at the back end of the hall, with their backs to the stage, where Varela was delivering a speech. “Whistleblowers need to be protected, and this conference is the right place to say it,” said Andre Dumoulin, one of the demonstrators and currently a professor at Universidad Latina de Panamá. 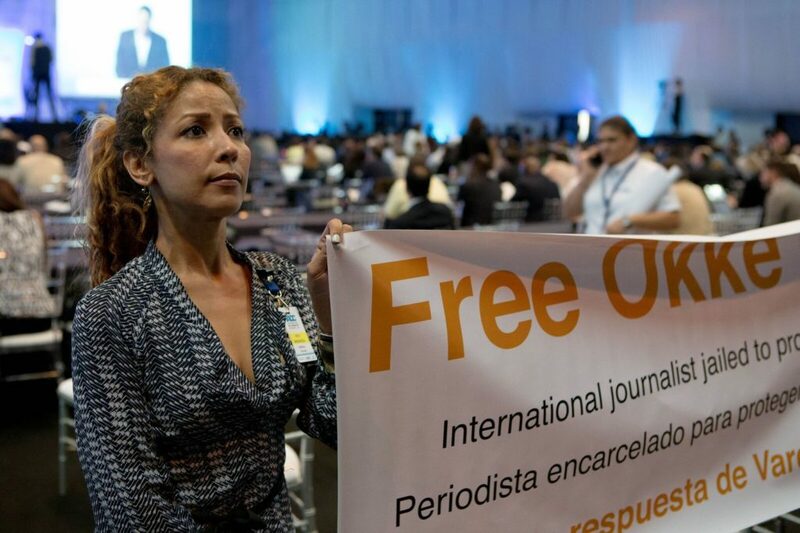 The Panama-based Dutch journalist has been detained since November 15th. He was arrested in relation to a criminal defamation conviction upon his arrival at the capital’s international airport, his lawyer Manuel Succari was quoted as saying. Ornstein’s news website, Bananama Republic, delivers “inconvenient truths” about the country, according to its Facebook Page. The site has been suspended by its operator pending the resolution of the charges. Lilia Mendoza, the other demonstrator, said their message wasn’t intended to “cause a scene,” urging participants to visit their website, www.freeokkeornstein.org. Demonstrators demand release of Okke Ornstein | 17th IACC Panama City from IACC on Vimeo. The demonstration was held for approximately three minutes. Various journalists’ organizations have also been been vocal in advocating for Ornstein’s release, including the Committee to Protect Journalists. Thomas Bruning, Secretary general of the NVJ (Dutch Association of Journalists) welcomed today’s move by the independent demonstrators saying that “it has shown to the world that the fight against corruption is only possible with a free press,” urging the Panamanian government to release the journalist as soon as possible. Jihye Lee is multimedia journalist in South Korea, freelancing for NBC Asian America and BuzzFeed News covering both Koreas. She’s recently interviewed a North Korean defector selling sausages for refugee smuggling projects in China, Southeast Asia. She is particularly interested in watching how social media is increasingly becoming a significant factor in journalism, especially in ways of vocalizing marginalized communities in the society. She has a master’s degree from Columbia Journalism School, where she received the Mencher Reporting Award for her master’s project on karaoke bars in Flushing, NY — recruting Korean women for prostitution through an illegal taxi network of madams, internet ads, and Korean messenger app, KakaoTalk. She is currently a news presenter at the local English radio in Seoul hosting newscasts at the top of the hour every hour from 3-7PM KST. She’s recently created a weekly news corner called “Trending Now,” covering viral content on local social media in Korea.